pdx noise: meet the movits! Movits! may reside in icy lands–Luleå, Sweden, just south of the Arctic Circle–but their apple stealing jazz is a fusion of swing and hip-hop that bursts with fiery energy, saxophone blasts, and frenetic pacing... all in unintelligible Swedish. Brothers Johan and Anders Rensfeldt along with friend Joakim Nilsson were making acoustic hip-hop when the divine Benny Goodman blessed them with a new musical vision and sound that melded the drums and the beats of old swing music with Swedish spittin'. They asked, "Why isn't anybody who's doing hip-hop, doing this kind of hip-hop?" Deciding it was time for a change, the trio absorbed themselves in recording a new noise with a dozen different musicians over the course of more than three years, finally releasing their first album under a new moniker in November 2008. Magically the Movits! were featured on The Colbert Report when Stephen Colbert discovered the video for their single "Fel Del Av Gården" on reddit.com. Zip, bang, boom, they were performing their Swedish hip-hop, swing blend on US national TV for an American audience. Contracts came from at home and abroad while their debut Äppelknyckarjazz (which translates to "Apple Stealing Jazz") reached #2 on the iTunes hip-hop charts and #18 overall, and the band finished their first, 15-date US tour in February just in time to jump back on a plane to hit five dates at this year's SXSW. Even with all the international interest, the boys are sticking to their Swedish roots and have no plans to record in English. Without knowing their native tongue, you'd never know their lyrics tell stories centered on social matters while spreading a message, but you can still bop and rock if your linguistics are lacking because their swingin' beats move beyond borders. 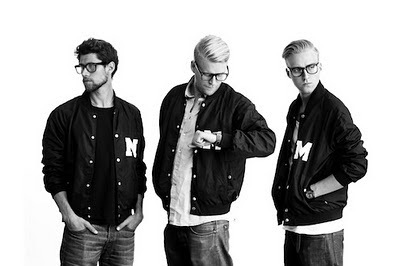 Read an interview with Movits! Joakim Nilsson on Spinner.